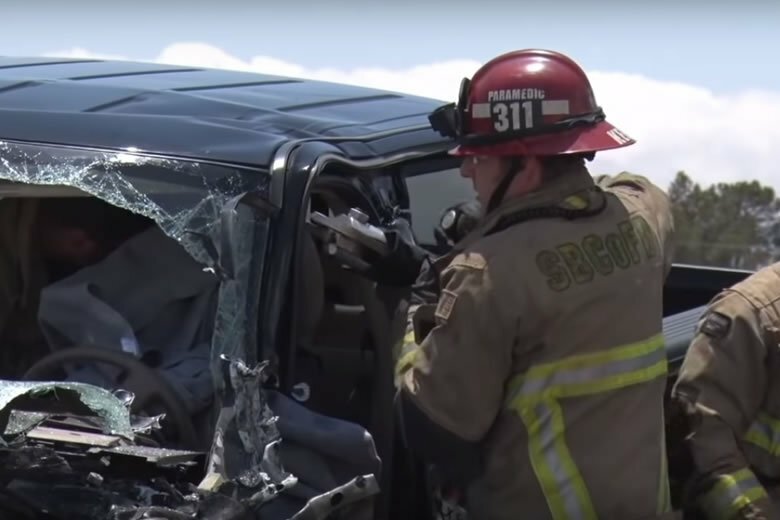 Driver Rescued from Vehicle Accident in Victorville after reports of a traffic collision in the area Green Tree Blvd and First Avenue just before 12:35 p.m on May 24. A traffic collision with injuries was dispatched which included one Paramedic Engine and an AMR ambulance. While enroute additional reports stated victims were possibly trapped. The assignment was modified at that point to include a Paramedic Truck company and a Chief Officer. The first arriving engine reported one immediate driver trapped in a collision involving a mid sized vehicle and a garbage truck. Crews initiated extrication as well as patient care to the victim trapped inside. The vehicle sustained major front end and drivers side damage. Firefighters used multiple hydraulic powered extrication tools to remove the vehicle from around the patient. It took Firefighters approximately 20 minutes extricate the victim. An air ambulance was requested to transport the patient to a trauma center down the hill. Once the victim was transported to the landing zone at Victor Valley Hospital he was evaluated and stabilized. County Fire responded with 1 paramedic engine company, 1 paramedic truck, 1 chief officer for a total of 7 personnel. The cause of the accident is currently under investigation by the San Bernardino County Sheriff’s Department.